We All Mistakes, Here are Mine. Read, Learn, Avoid! I’m actually writing this during night time… I couldn’t sleep so I figured it’s better to get up and do something useful than just lie in bed thinking about trading (yea, that’s what I do when I can’t sleep). A cup of coffee to my right, ashtray to my left (smoking is bad, I know, but I’m wearing a nicotine patch trying to kick that habit) and my cat eating my house plants (I wish there were a patch for that…) so everything is within normal parameters except the lack of sleep. But even without enough rest, it’s easy to see what a big mistake I made jumping into 60 second trading. It’s true that I don’t trade that way anymore but I must admit I was tempted at first by the opportunity of such quick profits and I tried it. I even had some success… of course it wasn’t because of my “analytical skills”, but rather due to a combination of luck and some strong movement of the market. The moment I realized I cannot consistently predict the outcome of the next one minute candle was also the last time I placed a 60 seconds binary option trade. The thing is that making money with this type of trading is perfectly viable and achievable (that’s what attracts us), but the main problem is consistency. Making some money today doesn’t help me if I’m gonna give it all back tomorrow. Everything that lacks consistency in trading is bound to fail sooner or later so yea, it’s possible to make money with 60 seconds… keeping them is the challenge. Metaphorically speaking, the spreadsheet is the thing that makes us push on and keeps the dream alive. On a more down-to-Earth note, it’s just… an Excel spreadsheet containing a calculation of how our account will look if we keep making a certain percentage every week, month or year and compounding our winnings. 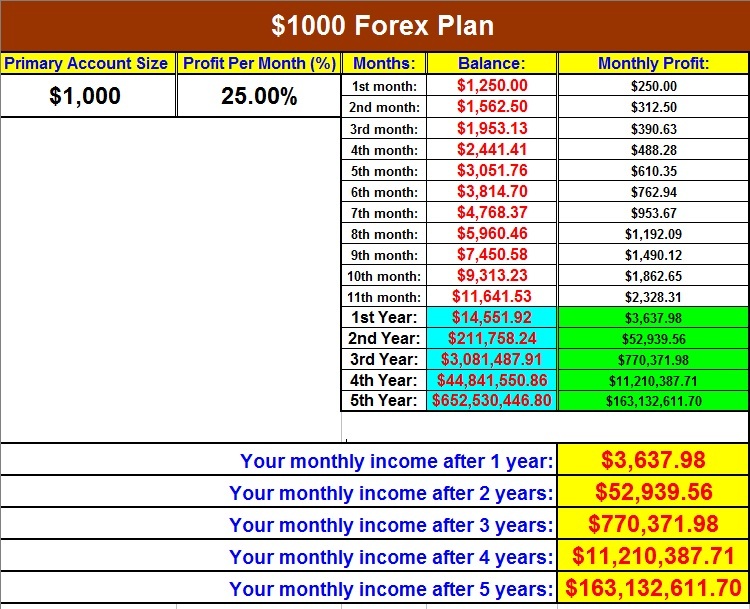 With “just” 15% added to your account every month you will make a million bucks in a few years and the Excel spreadsheet makes it look easy, but it doesn’t consider any other factors such as the psychological aspect. Fear, greed, doubt, losing streaks, broker interference, none of these are accounted for in the sheet so the goal of achieving your dream becomes somewhat closer but do not fall for it as I did. Trading with all its aspects is so much different than an Excel worksheet makes you believe and I learned it the hard and disappointing way; years passed and my account wasn’t where my spreadsheet said it would be. The thing is that you have to treat each trade as if your entire account depends on it and not think about how much money an Excel spreadsheet says you’re gonna have in a year or 5. We all know that scammers plague the Binary Options industry and give it a bad name. Well, I didn’t know it when I started trading and I deposited with the first broker I came in contact with. Sites like thatsucks.com were almost non-existent back then and I didn’t bother to read the Terms and Conditions of the broker… it was too much work and I was too busy getting rich to pay attention to signs of a potential scam or bad broker. I thought the Bonus is a welcome gift, not that it will tie my money to their platform; I thought the account manager is actually a good trader who wants me to get rich. Big mistake, but one I never made again. I learned the hard way not to make those mistakes again and I paid for all three of them. Hopefully all you’ll pay is just attention to my mistakes and you will avoid them in the future. Whether you are a new trader or a more advanced one, don’t make any of my mistakes and remember the words of Otto von Bismarck: “Only a fool learns from his own mistakes. The wise man learns from the mistakes of others”. Thanks for admitting and then sharing your mistakes. I did try the 60 sec stuff. $1 dollar per trade, lost some, won some. I came to the same conclusion, impossible at least for me, to be consistent with them. Meh, mildly fun but basically gambling. Broker madness, today I dodged the bullet. Solely due to the information on this site so 5 thousand thank you to everyone on BOTS. Now the tough one, again for me, excel spread sheets. Having taught Excel to beginning adults the power and fun of designing these, at times, have been a blast. However, I believe any spreadsheet, Data base (Filemaker Pro anyone) based on future information is nothing more than, at most, motivational. Spreadsheets based on current information is also not predictive of future success, but does help show your current results. Perhaps I still have a question, how would my views stated above get me in trouble as long as I do not let it change my money management system and only use it for past performance to focus in on optimizing strategies? Thanks again for this article in school. I started trading Binary Options with RB Options, in Canada??? Deposit $1000. A ” Pro” contacted me and said that he will trade for me. I was sceptical and he made a few winning trades. Then he asked that I increase funding and at that time most of his 5 trades won. I then deposited more money until my account balance was $11800. Then the ” Pro” Andy Goldman’ trades started loosing until he placed 14 trades and 4 won 1 tied and 9 losses. The trades he suggested was eg. a PUT on Bitcoin/ Bitstamp for $2500 the account balance was less than $5000 at the time. I questione his trade and he replied :” “Even if you are losing a few trading days, I am doing for you Money Management – and that is the real way to make money my friend, not WIN RATE”.